Abstract: The influence of faults and different lithology in the evaluation of possible seismic energy amplification has been studied. The area of Augusta, located in the Hyblean Plateau (south-eastern Sicily), was selected as test site and several ambient noise measurements were carried out with the aim of investigating the local seismic response. Data were gathered both on the main lithotypes outcropping in the study area and along some profiles crossing the Mt Tauro fault, in order to estimate the site response connected to the different geo-lithological features and to investigate on the possible amplification effects caused by the presence of a tectonic structure. The horizontal to vertical (H/V) spectral ratios calculated for the sites located near the fault showed a rough tendency towards amplifications in the frequency band 1.5–2.0 Hz, disappearing with increasing distances from the fault. Significant amplifications were observed at about 0.7 Hz in the sites located on the clays and in all the lithotypes laying on them. Observed dominant spectral peaks have been explained as the resonance of a soft sedimentary sequence overlaying an “equivalent basement” located inside the clayey formation at a depth of 160–290 m, or at the stratigraphic interface separating the clays from the calcareous basement. Finally, the results of 1-D modelling allowed us to delimitate the trend of the Augusta graben at depth. Abstract: Detailed paleontological and lithological studies of Lower Cretaceous sediments from the Northern Calcareous Alps in Lower Austria uncovered spectra of Lower Barremian macrofaunal elements (e.g. ammonoids). Within the Sparbach section, these investigations also uncovered an equivalent of the Karsteniceras Level, which is characterized by the abundance of Karsteniceras ternbergense Lukeneder and was initially described 150 km away in the Ternberg Nappe. Striking similarities in faunal spectra, lithology and geochemistry between these two laterally correlated occurrences are reported. The newly detected ammonoid mass-occurrence (Sparbach section) dominated by Karsteniceras ternbergense is of Early Barremian age (Coronites darsi Zone). About 250 specimens of K. ternbergense between 7 and 29 mm in diameter were investigated. The geochemical results indicate that the Karsteniceras mass-occurrence within this Lower Cretaceous succession was deposited under intermittent oxygen-depleted conditions. Due to the additional finding of the Karsteniceras Level at Sparbach, the formerly described Karsteniceras Level (KB1-B section, Upper Austria) takes on the status of a more widespread, laterally, biostratigraphically significant ‘horizon’, at least for the Northern Calcareous Alps. Its potential status as a stratigraphic horizon and its potential for correlation is underlined by its broad geographic range. The cephalopod fauna at the outcrop belongs exclusively to the Mediterranean Province. Abstract: A new genus, Geinitzaster, is erected for Oreaster decoratus Geinitz, 1871, originally described from the Upper Cenomanian of Saxony, Germany, and recently found also in the Upper Cenomanian of the Bohemian Cretaceous Basin. This enigmatic asteroid species lived in nearshore environments and is now known from only four localities in Bohemia: Predboj, Kuchynka near Brazdim, Radim and Velim-Veronika. The morphology of the dissociated ossicles is studied in detail and the function and position of individual ossicle types in the asteroid skeleton are discussed. 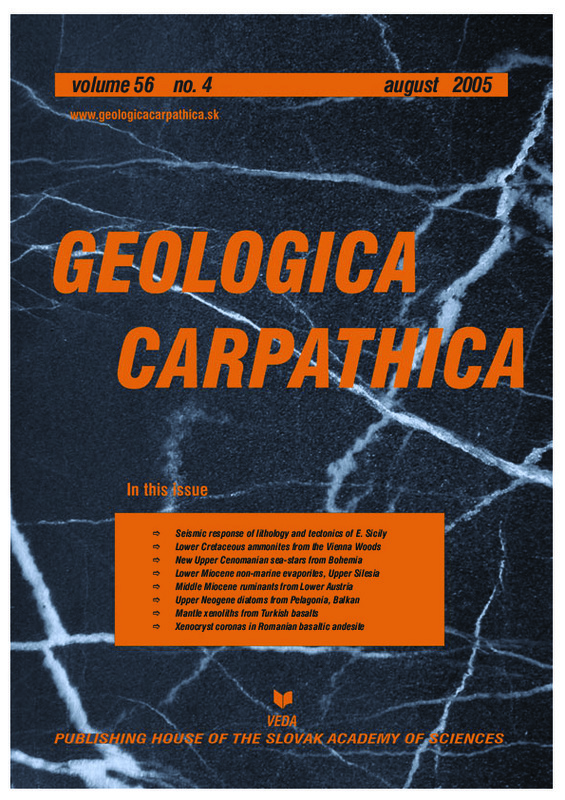 Abstract: A continual record of Eggenburgian to Late Badenian deposition, mostly in non-marine environments during the Early Miocene and in marine settings during the Middle Miocene time periods, was studied in the Woszczyce IG1 borehole (Zawada Basin, the Upper Silesia segment of the Carpathian Foreland Basin). In addition to the earlier-described Early Miocene foraminiferal assemblages, a Late Ottnangian pollen assemblage, which can be correlated with the MF4 Zone from Slovakia was found. Anhydrite-bearing deposits occur some 25 m below the Lower Badenian Skawina Formation. The foraminifers found immediately above the anhydrite-bearing complex and the redeposited foraminifers recorded in the lowermost part of the complex indicate its Karpatian age. The anhydrite is replacing gypsum, which originally formed displacive lenticular crystals within claystones and siltstones. The δ34S values of anhydrite (+2.17 ‰ to +9.2 ‰, average +4.4 ‰) are considerably lower and the δ18O values (+18.0 ‰ to +22.0 ‰, average +20.1 ‰) are considerably higher than the values characteristic for Miocene marine sulphates. On the other hand, the range of δ34S values found in the anhydrites of the Woszczyce IG1 borehole is similar to the range recorded in the sulphur from Carboniferous coals. The sulphate was recycled and evaporite deposits in the Woszczyce IG1 borehole, and thus in the entire Zawada Basin, formed from recycled solutes. Thus, the anhydrite-bearing sequence originated in a non-marine environment, in which periodically saline conditions prevailed. Abstract: The Badenian marine littoral Grund Formation at Grund in the Molasse Zone of Lower Austria provided marine and terrestrial faunas in the same strata. They allowed correlation between continental and marine biozonations of the European Middle Miocene. In the present paper for the first time the included fossil remains of Ruminantia are described in detail. Six isolated teeth and nine postcranial skeletal elements are determined as Ruminantia indet., Pecora indet., cf. Micromeryx flourensianus Lartet, 1851, Micromeryx cf. styriacus Thenius, 1950, and cf. Eotragus clavatus (Gervais, 1850). The biochronological age indicated by cf. M. flourensianus, M. cf. styriacus and cf. E. clavatus is restricted to the European mammal zones late MN5 to MN6. Consequently the hitherto identified age of late MN5 for these sediments is confirmed by the occurrence of the Ruminantia represented. The taxonomic composition further indicates paleoecological conditions compatible with earlier reconstructions of the environment as either islands or the elevated parts of a peninsula or rising terrain of the hinterland. In any of these settings groundwater levels would have been low and the vegetation a covering of woods, bushes and shrubs. Comparisons with Austrian ruminant faunas of the early MN5/late Karpatian (Oberganserndorf and Teiritzberg) support the interpretation of a change during MN5 towards a drier climate under more or less stable temperatures in Central Europe. Abstract: This paper presents data from an investigation of the Late Miocene-Pliocene siliceous microfossils (diatoms and chrysophycean stomatocysts) from borehole V-466, east of the city of Bitola, southern Macedonia. The diatom flora consists of 127 species, varieties, and forms of diatoms of thirty genera, eighteen families, five orders, and two classes. Four associations are distinguished in the development of the diatomaceous flora, as confirmed by cluster analysis. Ecological data for the diatom taxa and the frustule/chrysophycean stomatocysts ratio are used in an attempt to reconstruct in detail the paleoecological conditions at the time of sediment deposition in detail. Abstract: This paper represents the first report on the peridotitic mantle xenoliths including spinel harzburgites and spinel lherzolites found in the Late Miocene-Pliocene basaltic rocks (Thracean alkaline basalts — TAB) of the Thrace region, northwestern Turkey. The lavas formed and extruded during the north-south extension of western Anatolia, are olivine basalts and basanites displaying within-plate affinity. The estimated modal mineralogy of the peridotite xenoliths is olivine (58–84 %) + orthopyroxene (12–35 %) + clinopyroxene (0–12 %) + spinel (1–5 %). They are characterized mainly by protogranular and also transitional protogranular to porphyroclastic and fine-grained equigranular textures. Melt pockets are recognized in only one sample. Deformation features in olivine and pyroxenes are zoning, twinning, including inclusions, kink banding, triple junction and undulatory extinction. Bulk-rock analyses indicate that the xenoliths are depleted in basaltic components (e.g. CaO — 0.39–1.50 wt. %, Al2O3 — 0.80–1.78 wt. %). Light rare-earth element (LREE) enrichment is significant (e.g. Lan 2–6), which suggests a cryptic metasomatic history. Abstract: Olivine-bearing basaltic andesite from Detunata (Apuseni Mts, Romania) contains xenolithic material of sedimentary origin. Fragments of sandstone as well as isolated xenocrysts of quartz originated from sandstone, were identified. Reaction coronas consisting of pyroxene, tridymite, quartz fragments and glass are developed around some of the sandstone fragments and quartz xenocrysts, as a result of interaction between the xenolithic material and the host basaltic magma. Coronas can be divided into two distinctive parts. The outer one consists of a glassy matrix containing prismatic crystals of augite. The inner part of the coronas consists of isolated crystals of augite, fragments of quartz and tridymite in a glassy groundmass. Tridymite is also present along fractures in the quartz xenocrysts. Electron probe microanalysis and Raman spectroscopy were used to investigate the corona pyroxenes, glass, and silica polymorphs. The corona pyroxenes have chemical compositions typical for augite. The glass is highly siliceous (SiO2 = 72.0–76.8 wt. %) as a result of quartz dissolution, high in alkalis (Na2O = 1.38–3.22 wt. %; K2O = 4.72–6.23 wt. %) and aluminum (Al2O3 = 9.31–12.18 wt. %). Tabular and twinned crystals of tridymite have a high content of alkalis (Na2O+K2O = 0.30–0.39 wt. %) and alumina (Al2O3 = 0.54–0.86 wt. %) as compared to quartz xenocrysts. Raman spectra of tridymite show the most representative peaks at 403 and 422 cm–1. The geochemistry of reaction corona, diffusion processes, and temperature were the controlling factors in the genesis of the newly-formed minerals in the reaction zones. The xenolithic material was partly assimilated, and represented an important source of Si4+, Al3+, Ca2+, Mg2+, Fe2+ and K+. The spatial relationship between reaction pyroxenes and host basaltic andesite suggests that magma could also be the source for cations such as Ca2+, Mg2+ and Fe2+. The relatively higher content in alkalis of the volcanic glass from the basaltic andesite groundmass as compared to the glass of the corona suggests an enrichment in alkalis of the late differentiated magmatic melt which could represent the main source of alkaline cations (Na+ and K+). The genesis of the corona took place at low pressure, during the eruption of the basaltic magma. The presence of tridymite in the corona indicates temperatures higher than 870 °C while the presence of calcite in some xenoliths points to temperatures below 920 °C.